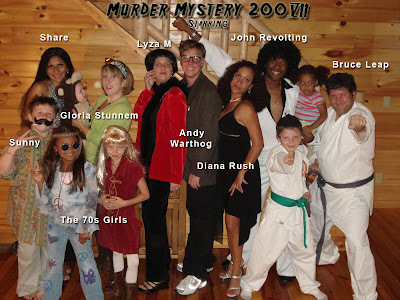 Once again, my family joined together with our friends and their families for our annual game of Murder Mystery Theater. We all took a Friday off from work and school and road tripped up to Elijay, where we enjoyed some much needed down-time in an awesome cabin in the Georgia mountains. We spent Friday hanging around doing a lot of nothing and Saturday morning, we went to the local Apple Festival. As always, we had good food, great drinks and lots of laughs. Good times! This mystery occurs in 1979 at the trendy Studio Manhattan, a chic and glamorous New York discotheque frequented by the rich and famous. Tonight’s exclusive crowd of celebrities is feverishly dancing the Hustle to the throbbing rhythmic beat of disco. The music stops abruptly when the club’s owner, Jackie Fever, is found murdered in the backstage office. The flamboyant Ms. Fever was fatally stabbed – obviously by someone she knew. And everyone is a suspect! Love the twist on the characters.